This scene was made by orphaned students in Kenya. 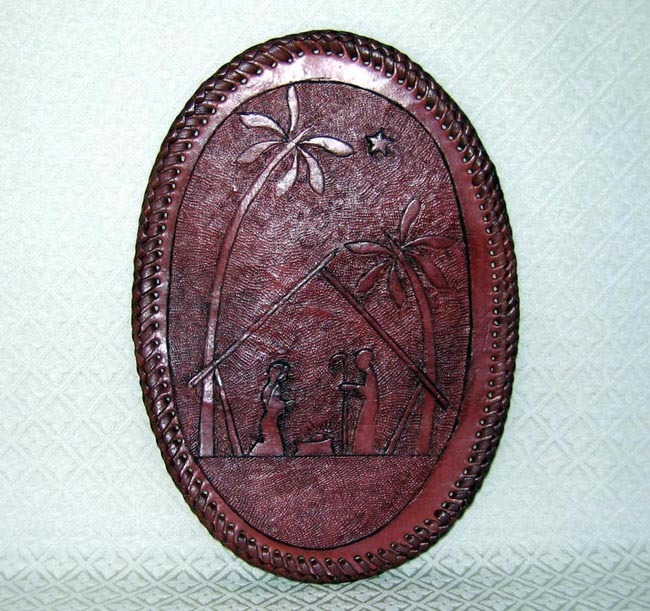 It depicts the Holy Family in a stable beneath two large palm trees, all carved on an oval piece of leather. The scene measures 13 inches tall by 9 inches wide. In Holland a manager of a nut-import company sponsored two orphanages in Mombasa and Nairobi, Kenya. His employees funded the project by donating a part of their salary each month. Eventually they managed to build two schools near the orphanages. Each year, some of the Dutch employees were sent to Kenya to evaluate the schools’ progress. When the manager passed away, another worker from the company decided to proceed with managing the project. Students in these Kenyan schools continue to be educated for jobs so that later in life they can earn money. Currently the students have arts and crafts lessons and they sell the items they make to help support their schools. This leather scene was commissioned by one of our clients in the Netherlands and then generously gifted to us.